The main topic of Mr. Fischer´s lecture were the perspectives of development in four countries of the South and East Mediterranean Region: Morocco, Egypt, Jordan, and Tunisia. 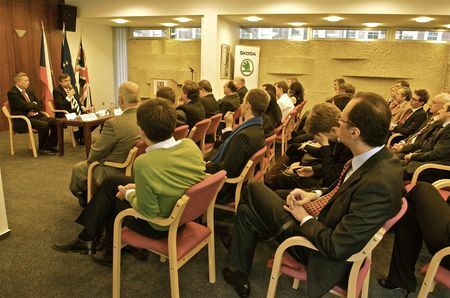 The vivid and thorough discussion chaired by deputy Ambassador Antonin Hradilek was attended by British and Czech professionals mostly from business and finance, diplomats, and representatives of think-tanks. In the audience were also Czech students of economics from British universities. CZECH THE TRENDS are a series of discussions given by outstanding personalities who are specialists in their field. The series will encompass topics including, but not confined to, economic, financial market, business, trade and technological developments in the Czech Republic, the EU and on the international scene. Jan Fischer, born in Prague in 1951 to a family of mathematical statisticians and actuarial mathematicians. He graduated in 1974 with a degree in statistics and econometrics from the national economics faculty of the University of Economics in Prague (VSE). Upon graduation, he joined the Research Institute of Socioeconomic Information. In 1985, he completed his postgraduate studies in the field of economic statistics. He then served in various positions at the Federal Statistical Office of Czechoslovakia until 1990 when he became Vice President of the Institute. In 1993, after the creation of the Czech Republic he was appointed Vice President of the new Czech Statistical Office. In September 2000 he was the Director of the Production Department of the Taylor Nelson Sofres Factum company, and from March 2002 to April 2003 he was Head of Research Facilities at the Faculty of Informatics and Statistics, VSE. In April 2003, he became President of the Czech Statistical Office. In April 2009, Mr Fischer was appointed Prime Minister of the Czech Republic, a post he held until after the elections in June 2010. During the first three months of that period he was also President-in-Office when the Czech Republic held the Presidency of the Council of the European Union for first half of 2009. In September 2010, he joined the European Bank for Reconstruction and Development (EBRD) as Vice President for Operational Policy. At the EBRD, Mr Fischer is responsible for coordinating the country strategies, development and delivery of the Bank’s policies in various areas as well as maintaining high level relations with EU institutions and governments. 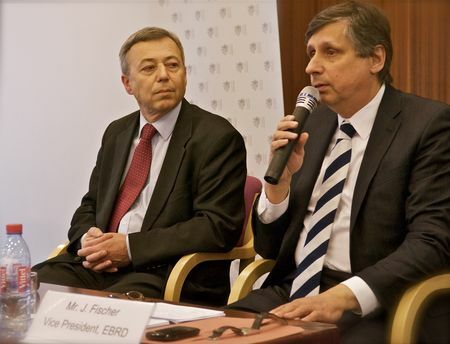 Mr Fischer is a member of a number of prestigious institutions, including the Czech Statistics Society, the International Statistics Institute, the Science Council, the Board of Trustees of the University of Economics, Prague, as well as the Science Council of J E Purkyně in Ústí nad Labem.